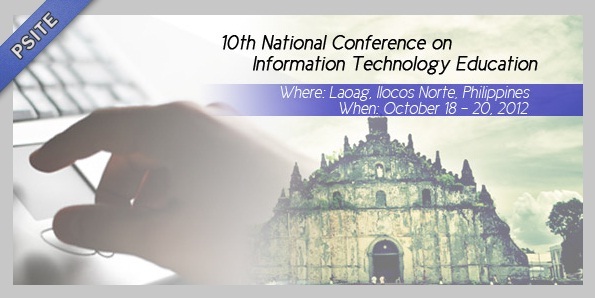 NCITE 2012 is organized by the Philippine Society of I.T. Educators Foundation, Inc. (PSITE) in cooperation with PSITE Region 1 Chapter. Authors are invited to submit original, unpublished full research papers for presentation at NCITE 2012. The Conference Review Policy requires that each submitted paper will be peer-reviewed by at least two reviewers for inclusion in the conference program and CD-ROM proceedings. A review of all papers is undertaken by the members of the Paper Review Committee to determine the outstanding paper award. One author per paper is required to register and attend the conference to present the paper if accepted. The full papers are due by August 17, 2012. Authors of accepted papers will be notified by September 14, 2012 via e-mail. Final version of the poster or paper and presentation slides are due on September 21, 2012. A maximum of fifteen pages, including an abstract of up to 200 words will be allowed for each accepted paper in the proceedings. All manuscripts and slides must be submitted electronically, in PDF format and formatted using the ACM templates available at http://www.acm.org/sigs/pubs/proceed/template.html. Submit your papers and posters (in PDF) to https://www.easychair.org/conferences/?conf=ncite2012. You have to create an account first atwww.easychair.org in order to submit in the conference page. Student authors are encouraged to submit research posters. It is a large document meant to communicate your research in a short period of time. It is composed of a short title, list of authors (and their affiliations), an introduction, an overview of your methods, your results, an insightful discussion of results, and bibliography. The size of the poster shall be A0 (33.1 in x 46.8 in), landscape. The submission date for posters is the same as that of full papers. Please note that research posters will not be published in the conference proceedings and not eligible for best paper award. Authors will be responsible for their travel and living expenses. The conference CD-ROM will contain the full paper and slides of all research papers presented and will be distributed free-of-charge to all conference participants. 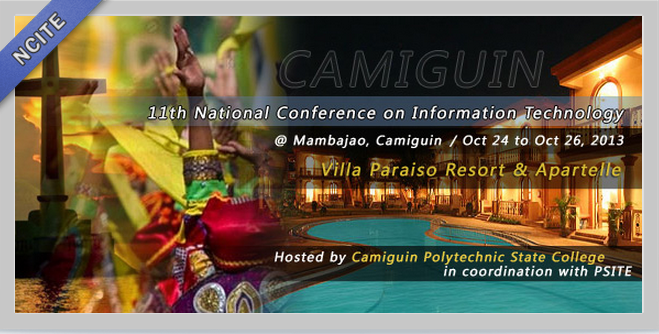 The NCITE2012 conference fee is PHP 4,000.00. This includes the conference kits, CD conference proceedings, and conference food. All participants will be responsible for their hotel accommodation. Accommodation is not part of the conference fee. Participants may avail of a discounted conference rate of PHP 3,600.00 if they pay their registration fees on or before September 18, 2012. Early payments should be deposited to PSITE's Allied Bank Account. The author who will present the accepted paper or accepted poster may avail of a discounted rate of PHP 3,600.00 even during the on-site registration. The author should present a printout of the acceptance letter sent by NCITE2012 Secretariat. Please scan your validated deposit slip and register online ( http://ncite.psite.ph/register ) for confirmation of your attendance. Please present your deposit slip to the convention secretariat during the onsite registration for verification and issuance of official receipts. A list of hotels and inns located near the conference venue with the corresponding rates and contact details will be provided in a separate document. Authors and conference participants are responsible for their accommodations. Please direct questions to ncite.secretariat@gmail.com.